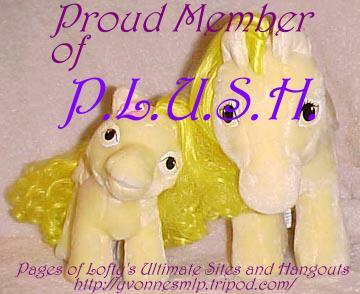 P.L.U.S.H Welcome to P.L.U.S.H - Pages of Lofty's Ultimate Sites and Hangouts! This is I hope to be one day the largest My Little Pony site directory on the net. I am always searching through sites to find the sale pages that have the one pony that I need or I want to ask a question about a certain pony or just want to chat or expand my webpage on certain topics. That is the reason for P.L.U.S.H. I hope you find the categories to be useful and helpful in obtaing the specific info you are looking for. I.E. you are looking for the missing piece to Baby Bonnets School of Dance. You could look under the sale category and find links that go directly to other sites sale pages. Easy Right! If you have a pony site that is NOT already listed here please feel out the following form and I will review it and add it. The only requirement to get listed is that it is a mostly MLP site that is child friendly. There is a banner at the bottom if you wish to add it to your site to show support and it is optional. Have Fun and hope you enjoy surfing this site! Would you like a invitation to join the LPP Group (Lofty's Yahoo Group)? Yes, Invite me! No, maybe later! Click the banner, then right click it and select "Save Picture as.."